The second edition of a study showing the effect of electric lighting around the World has been published and it's results are quite astonishing. According to the data collected from satellite images and light readings taken by scientists across the world, over 99% of Americans and Europeans are affected by artificial sky glow. At a time where the circadian rhythm is beginning to be studied in more depth, this shows that it's not just blue-light emitting devices which could affect us and our sleep patterns, but our decisions in how we light our towns and cities across the World. 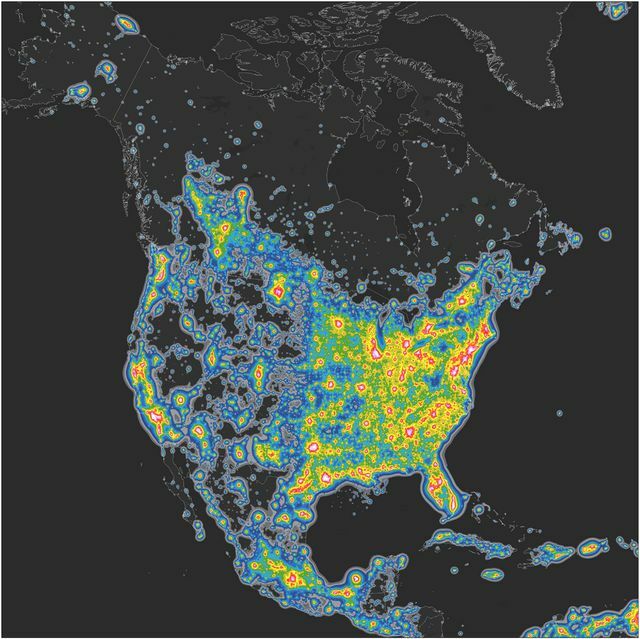 Even more concerning is the atlas image showing the likely effect of a total blanket swap to LED technology, likely to boost light pollution even further. On the back of this, maybe it is time we started taking light pollution more seriously and ask whether street lighting throughout the nighttime is absolutely essential? While I understand the argument that lighting creates safer environments, I would also be interested to see how much energy would be saved every single day around the World if lighting was only used up to a certain time in an evening and/or switched off in non-essential areas, e.g city centres. Personally, I have a feeling we would get by just fine and help protect the Earth for future generations. Moreover, more than 80% of the world’s citizens and more than 99% of those in the U.S. and Europe live under an artificial sky-glow, or reflected light scatter in the atmosphere from the electric lighting below. This isn’t just a problem in megacities and urban areas. For instance, Death Valley is awash with skyglow from Las Vegas and Los Angeles, which are 80 and 150 km away, respectively. Singapore is the most light-polluted country, where the entire population lives under skies so bright that their eyes can never fully adapt to night vision. Vitrually everyone living in Kuwait, Qatar, United Arab Emirates, and Saudi Arabia also experiences this level of light pollution. The countries with populations least affected by light pollution are Chad, Central African Republic, and Madagascar, with more than three-quarters of their population living under pristine sky conditions.